Siemens Named "Most Squeaky Clean Company"
The United States Is Unprepared? "We are now the most squeaky clean company," a raft of senior Siemens executives said behind closed doors at a global media summit held this week in London. It's a huge claim but they've all been through intensive compliance training and exhaustive interviews to ensure that Europe's leading technology group is no longer a byword for bribery and corruption. If you can't trust senior Siemens executives (behind closed doors no less) attempting to fend off bribery and corruption allegations, who can you trust? That being said, what if they are right? What if they really are the most squeaky clean company on the planet right now? Anything is possible. I once worked at Cendant. Therefore, who am I to argue? Ever since the scandal broke in late 2006 the company has been confronted with mounting evidence that officials, perhaps under the blind eye or with the covert connivance of senior managers, used bribes across the globe to win lucrative contracts. It has identified so far €1.3bn (£1bn) in slush funds and put the cost of cleaning out its Augean stables at €1.8bn. Further, even if the squeaky clean claims are somewhat exaggerated, surely the company is at least as squeaky clean as it was a hundred years ago. Of course, that's probably not saying much come to think of it. The Siemens Scandal (シーメンス事件, Shiimensu jiken?) of January 1914 was one of several spectacular political scandals of late Meiji and Taisho period Japanese politics. It involved collusion between several high ranking members of the Imperial Japanese Navy and the German industrial conglomerate of Siemens AG. Why choose between the two painful eras when we can have both simultaneously? The following two articles were in the top ten most read on MarketWatch today (the first was #1 and the second was #6). NEW YORK (MarketWatch) -- U.S. stocks fell sharply Thursday with the blue-chip index enduring its worst June so far since 1930, and plunging to its lowest finish since Sept. 11, 2006, after getting slammed hard as crude soared to new highs and Goldman Sachs disparaged U.S. brokers and advised selling General Motors Corp. The automaker is considering a plan that would amount to the first across-the-board price hike since 1974, at what was then the height of the previous oil crisis, the Nikkei newspaper reported, citing an unidentified senior Toyota official. One foot goes in the liquid nitrogen. The other foot goes in the molten lava. We're still doing well on average though. Oh well, at least the country isn't a dust bowl. Any idea that this year's corn crop would yield the bounty needed to ease already short supplies is gone. Corn prices have increased by more than 80 percent in the past year on demand overseas and to fuel ethanol plants, contributing to global food-price inflation at a time of rapid economic growth in China, India and other developing nations. We're fine as long as nobody does the math and/or the math is only done by Wall Street analysts on our behalf. Farmers whose fields are under water are starting to do their own math. Only ninjas can spot ninjas. I thought everyone knew that. Clearly the ninja was an impostor. Exactly. It was an Illusion of Ninja. Since there appears to be some confusion on the role of ninjas in our economy, perhaps now would be a good time to point out that ninja loans were not backed by the full faith and credit of actual ninjas. Had they been, we wouldn't be in such dire straits right now. Unfortunately, ninja loans weren't backed by anything at all. We know this to be true because it would be impossible to secure a loan from a known ninja. If you meet one and you somehow manage to recognize him as a ninja, then you wouldn't live long enough to sign the paperwork. That being said, if you are absolutely convinced the person handing you paperwork to sign in a bank is NOT a ninja, then you should be very suspicious. Only a ninja could absolutely convince you that he or she is not a ninja. They are masters of disguise. You should be doubly suspicious if you can't fully understand the details of the paperwork but are thinking of signing it anyway. Ninjas are also known for their subterfuge and mind control. Those who have purchased this volume with the idea of employing mind control to further their own selfish motives will be sadly disappointed. You can't employ mind control to further your own selfish motives by reading just one book. That's fairly obvious. It takes at least two books. BILLIONAIRE investor Warren Buffett said today the United States was experiencing "exploding" inflation amid a slowing economy. The chairman and chief executive of Berkshire Hathaway said the world’s biggest economy was in the middle of a period of stagflation and it might get worse. "I think we are in the middle of it," he told Bloomberg TV, adding he's uncertain when that will end, "maybe not even next year." Performance is historical and does not guarantee future results. Well, that certainly must be a relief to most shareholders (the exception being shareholders who were looking to lock in future losses). There's an "awesome opportunity" here for those willing to make a lot of money with absolutely no risk. Here's my idea which you are free to use. Form a company to guarantee those future results. How hard could it be? Create a mutual fund insurance company. Offer to guarantee the domestic earnings etfs historical performance (average annual returns since inception as shown in the above link) into the distant future. Be sure to lock that negative rate in based on the current data. You don't want any "adjustable rate" surprises if the economy actually does recover at some point. As the money comes in, spend ~5% frivolously on yachts and/or partying. (Think Dennis Kozlowski.) That should leave 95% you can safely bury in the back yard to pay back investors. Spend the hefty fees on yachts and/or partying too. That's twice the fun. Sure thing. Can't lose. You simply need to find people willing to buy the insurance. That's all. While you are busy doing that look for me on my new late night infomercial: You Too Can Make Money Insuring Others. You don't even need to be too big to fail. If MBIA and Ambac can do it, so can you! The trick is to insure things so big nobody could even begin to imagine how you could pay the claim if something bad happened. Also look for my new book: Lost Your Job? Insure Homeowners Against Nuclear War! I'll Show You How! I don't think this is investment advice. It is certainly not intended to be. It might be humor. Then again it might not. I guess it just depends on whether or not you were laughing when you read the links. He has been consistent in his judgment that there is no national housing bubble. "I think that's the most disturbing part of the report," said Mark Zandi, chief economist for Moody's Economy.com. "It shows the declines are now across all markets, that this is a nationwide housing collapse rather than one in a few markets." Okay, maybe you can fight the Fed. They don't quite seem to know what to do or say. They have clearly lost some credibility on both the slowing growth front and the inflation expectations front. About one in four homes sales are distressed sales, Zandi estimated, with that number rising sharply in the once red-hot housing market like Las Vegas, Phoenix and Southern California. The Fed is trapped within the wet paper helicopter Piñata and there you are holding a baseball bat. Take another swing. Candy (stimulus money) keeps falling out every time you do. Hurray! An industry group Tuesday said U.S. consumer confidence plummeted more sharply than expected in June to it lowest level in more than 16 years. The Conference Board's reading of consumers' expectations hit an all-time low. Seriously. The Fed doesn't even seem to have a dull butter knife to cut its way out of the bag it's in. June 24 (Bloomberg) -- Dow Chemical Co. will raise prices as much as 25 percent in July, the largest increase in company history and the second in two months, to recoup surging energy and raw-material costs. Then again, maybe I'm not kiddin'. The company's cumulative price increases since May approach 50 percent, Kevin McCarthy, an analyst at Banc of America Securities, said in a report. Dow's 3,200 products are used in thousands of consumer products, including diapers, sneaker soles, carpets and plastic bottles. How about plastic credit cards? Capital One is back to flooding my mail box with 0% credit card offers. The last "priority notification" was "personal and contains dated, time-sensitive material to be opened by the addressee only." It was apparently for my eyes only. I'm not a very good secret agent though. My bird is currently reading the offer as it is in the bottom of her cage. Three factories in the Dow Automotive unit will be permanently shut because of declining North American sales, the company said. Details on specific plant closures, job cuts and related charges haven't been determined, said Chris Huntley, a company spokesman. Surely the permanent closures are only temporary. We're only a week away from the fabled and long awaited second half of year recovery. Forty years later his prediction of doom and gloom is playing out. Dingell, a Michigan Democrat, said Congress should explore ``a full range of options'' to limit speculation, including raising margin requirements for financial speculators to 50 percent, preventing pension funds from investing in commodities and prohibiting investment banks from owning energy assets. He is best known for his book Les Propheties, the first edition of which appeared in 1555. Since the publication of this book, which has rarely been out of print since his death, Nostradamus has attracted an enthusiastic following who, along with the popular press, credit him with predicting many major world events. Greenspan's "Age of Turbulence" book comes to mind. In contrast, most academic sources maintain that the associations made between world events and Nostradamus's quatrains are largely the result of misinterpretations or mistranslations (sometimes deliberate) or else are so tenuous as to render them useless as evidence of any genuine predictive power. Tell me that's not how analysts reacted to Greenspan's writing while he was Fed Chairman and I'll eat a bug. Some scholars believe that Nostradamus wrote not to be a prophet, but to comment on events that were happening in his own time, writing in his elusive way — using highly metaphorical and cryptic language — to avoid persecution. This could very well be the same person. In order to be sure, I do have one question though. Did Nostradamus actually help create the disasters he warned of? Confusing headline I know but I just didn't know how else to write it. June 23 (Bloomberg) -- Republic Services Inc. agreed to buy larger rival Allied Waste Industries Inc. for $6.1 billion to become North America's second-largest trash hauler as a weaker economy and rising fuel prices strain waste-removal companies. Smaller company buys larger company. Republic's debt is currently rated BBB+ by Standard & Poor's, the third-lowest investment-grade rating. Allied's debt has junk status, ranked BB by S&P, or two levels below investment-grade. One is just above junk. The other is junk. Both are garbage companies. A competing offer for Allied is unlikely, Goldman, Sachs & Co. analysts led by David Feinberg, said in a note to clients. Goldman said ``rational pricing'' in the solid-waste industry would be among the benefits of the transaction and would help Waste Management as well. Is it because I love hoarding garbage? Certainly not. Is it because I'm currently an Allied customer? I am but that's not it. Is it because I'm looking forward to rational pricing? Nope! One of the creative ways people are saving, is cutting out the middle man and making the trip here, where eggs are cheaper. What are they doing to get there? Walking? The price of grocery store eggs has gone up at the highest rate since 1984, according to federal tracking data. The national average is now climbing to $3 a dozen. Considering the size of the planet, I'm not all that far from this egg farm in Pasco. It is about 200 miles. If I drive slow and/or slipstream behind a Hummer (presumably also driving to Pasco to buy eggs) I can make the round trip on one tank of gasoline. Cheaper eggs here I come! Realtors say providing tours of foreclosed homes such as this one is more than just a game of bargain hunting. It's also a way to educate prospective buyers and to help out the community. In keeping with the 1970s theme, here's something from 1972. The latest plan circulating in Congress would ban large institutional investors from trading commodities altogether. It is a radical idea that might sound appealing to motorists and small business owners, but experts say it would actually do little to lower prices and could have the opposite effect. If that happened, the central bank wouldn't be able to sell enough bills to soak up excess cash, increasing the risk of asset bubbles and accelerating inflation, he said. The world needs a giant cash sponge apparently. The dotcom bubble worked until it popped. The global housing bubble worked until it popped. The China stock bubble worked until it popped. I refer you to a chart showing why a giant cash sponge is truly needed. Here's my first solution. A paper towel bubble would seem the perfect excess cash sponge in this environment. All that money could be used to buy and hoard paper towels. People would feel more upbeat as they saw the value of their paper towel holdings increase. Unfortunately, unlike the other bubbles it would affect the CPI. It is therefore not a preferred bubble in the minds of central bankers. What if we excluded paper towels from the CPI though when talking of the economy? We could speak of the CPI ex-food, ex-energy, and ex-paper towels. That way people could hoard as many paper towels as they liked without anyone caring. I know what you are thinking. Mark, you'll make out like a bandit since you have already hoarded paper towels and the price would skyrocket. You've got me there. Shame on me. I therefore withdraw this solution as being too self-serving. Although Greenspan has stated that it is impossible to see a bubble, I'm confident he would have noticed a paper towel bubble just the same. He no doubt would have responded somewhat appropriately in the face of much higher paper towel prices (especially if most prices like canned goods rose similarly). I also suspect Bernanke could spot a paper towel bubble, but am somewhat less confident since he's so scared of deflation. I'm hoarding anyway though. Go figure. This brings me to my second solution and it would seemingly play on Bernanke's strengths. A serious deflation scare could see people bury dollars in their backyards. That would be the very best giant cash sponge money could (not) buy, at least temporarily. It would put a short-term end to all bubbles. Perhaps Bernanke just needs to write another deflation speech, only this time without the helicopter references. He could also imply the impending deflationary crash is a permanent fixture of our overleveraged society, thereby trapping said dollars in backyards for all eternity. This solution could clearly work if we were willing to endure the pain that such a speech would bring. Solving "dangerous and intractable" economic problems involving "huge imbalances and risks" is not my forte it seems. Sorry about that. Maybe I'll just stick to heckling those who think they have viable solutions. "Altogether, the circumstances seem as dangerous and intractable as I can remember," Volcker said during a keynote address at the second annual summit of the Stanford Institute for Economic Policy Research. "But no one is willing to understand [this] and do anything about it." Greenspan sees turbulence, inflation, and possibly even stagflation coming too. What is it you former Fed Chairmen see behind closed doors to make you so paranoid? Is it a coincidence that Volcker gave his speech at the peak of the housing bubble? Is it a coincidence that Greenspan published his "Age of Turbulence" book within a month or two of the credit crisis unfolding? Check out the picture of the gas station. It is what you get when you remove price controls that can't work long-term. Cars queue up in front of a gas station to buy as much of fuel as possible before oil prices are hiked at midnight in Beijing June 19, 2008. China announced Thursday evening that gasoline and diesel prices would be hiked by about 18%. The government was forced to raise oil prices from midnight last night, the first time in eight months, because of the soaring price of crude in the international market. The Carter Administration began a phased decontrol of oil prices on 5 April when the average price of crude oil was US$15.85. Over the next 12 months the price of crude oil rose to $39.50 (its all time highest real price until May 7th, 2008). The price of gasoline was $0.706 in March 1979. It peaked at $1.352 in March 1981. During this period domestic U.S. oil output rose sharply from the large Prudhoe Bay fields while oil imports fell sharply. Something tells me we won't quite be so lucky this time, even with China finally throwing some of the price control towel into the ring. Further, that's just one more cost Chinese companies are going to need to absorb when attempting to send us cheap goods. If there's something you've been eyeing at Wal-Mart, there are probably worse times to buy/hoard it. It doesn't end with oil. Electricity is also going up. The increase in power tariff will not create a big impact on the CPI because urban and rural residents have been exempted. If urban and rural residents won't absorb the cost, who will? Somebody surely must pay. Perhaps this would be a bad time to point out that we are not Chinese urban and rural residents. Or is that just stagflationary nonsense too? One reason to learn economics is to get a handle on what's worth worrying about and what isn't. You don't need to know a lot of economics to know the possibility of simultaneously worsening inflation and rising unemployment isn't worth losing any sleep over. You certainly don't need to know a lot of economics when you visit Zimbabwe. There's 85% unemployment and nearly one million percent inflation. I certainly sleep better knowing that what they are going through is nonsense. To me, a tell-tale sign of incomprehension is anyone who says we're headed for stagflation. You know they're too young to have lived through the stagflation of the 1970s and so know what it really is, what caused it and why it's highly unlikely to happen at present. I've apparently been a tell-tale sign of incomprehension since 2004. It is/was my belief that negative real interest rates (conveniently ignored in his analysis) create vast hoarding opportunities. Further, I would argue that the "present" has been nearly a decade so far. Very few investments have kept up with the price of gold over the last nine years. Next up, toilet paper? Most of the silly talk we hear of stagflation arises simply because it takes time for a change in direction to work its way through the economy. Because there's a relatively brief lag before slowing demand leads to a declining inflation rate. Here's some "silly talk" Ross Gittins was offering in 1999. Too bad he didn't mention stagflation fears back then. It would have been a fantastic time to embrace stagflation whole-heartedly (i.e., invest in oil, gold, and silver). He was too busy writing how great things were instead. The “rear vision mirror” refers to the social and human price being exacted by these processes. Output, productivity and profits are soaring, benefitting a thin privileged layer, precisely through the destruction of jobs, living standards and social conditions for the majority of people. Two days after the “golden age” report was released, the latest labour force statistics showed that full-time employment is continuing to fall. Economists and business commentators had confidently predicted that the current 4 percent annual economic growth would translate into a rise of up to 50,000 in employment levels during May. Instead, the total number of people employed increased by just 1,000. Part-time employment rose 7,500, but full-time fell by 6,500. Moreover, another 15,700 people gave up looking for full-time work. The official unemployment rate remained unchanged at 7.5 percent. Perhaps the "golden age" was to be taken literally. You could have bought gold for a mere $260 an ounce in June of 1999. It is now $891. So let's sum this up. My fears are nonsense. I'm incomprehensible. I'm silly. I should stop losing sleep. Oh how I wish I could do the latter. I'll try to remember that when I'm paying 18% higher medical insurance premiums starting in August (which I am). Instead, I'll write a letter to my insurance company explaining that since unemployment is picking up what they are doing is nearly as nonsensical as what is going on in Zimbabwe. I'll write a similar letter to China and explain that they must continue to send us even cheaper goods and must immediately stop using the paper money we send them (in exchange) to buy oil. It is nonsense! That money was best kept buried in a secret chest never to be seen again! Look at those gas prices. I just can't stop gawking at the sign. $1.79 for premium gasoline? That's the most amazing thing I've seen in a long, long time! The producer-price index jump exceeded the 1 percent forecast among economists surveyed by Bloomberg News. It was the biggest increase since November. The Labor Department's figures also showed that prices rose 0.2 percent excluding food and energy, a measure that matched economists' predictions. Production was expected to increase 0.1 percent. In the United Kingdom it is now common for the party to last for more than one evening, hence the increasing prevalence of the phrase "stag weekend". That's just a hop, skip, and a jump to stag decade. Just about every Bucks night\Bucks Turn features a stripper commonly referred to as the pouch. In other words, the pouch gets stripped during the Stag Party on Buck's night. I love it when all the pieces of The Bernanke Code fall into place. And it's not just pouches -- you can find some really creative ways to hide your money. Even a wallet kept in your front pocket can be taken by an experienced pickpocket. Ben Bernanke really doesn't have all that much experience yet but he's a quick study. "Markets are becoming aware of the fact that the decline in house prices is not stopping. I have no particular regrets. The housing bubble is not a reflection of what we did, as it is a global phenomenon." No single failed dam believes it is responsible for the flood. Know your risk. Do you live downstream from a dam? Is the dam a high-hazard or significant-hazard potential dam? The risk was clearly high. We all lived downstream from the significant-hazard liquidity dam. The cleanup efforts are turning it into something potentially worse. Find out who owns the dam and who regulates the dam. Technically, we all own the dam. Greenspan regulated it but he handed that "responsibility" over to Bernanke. "A global phenomenon" is apparently now repsonsible for OUR housing bubble. Hopefully the global phenomenon has even more prosperity planned for us. Once you determine that you live downstream from a high-hazard or significant-hazard potential dam and find out who owns the dam, see if a current EAP is in place for the dam. An EAP is a formal document that identifies potential emergency conditions at a dam and specifies preplanned actions to be followed to reduce property damage and loss of life. The property damage has been enormous so far. I can only infer the EAP based on the responsible parties' actions. In 2002, there was talk of helicopters and easy money. This was followed up by denial and/or subprime containment speeches. Then there was sheer unadulterated panic in the form of intermeeting rate cuts and emergency Bear Stearns action. Now these same responsible parties are telling us that the risk of a serious economic downturn has diminished, again. There's been very little talk of actually repairing the dam. 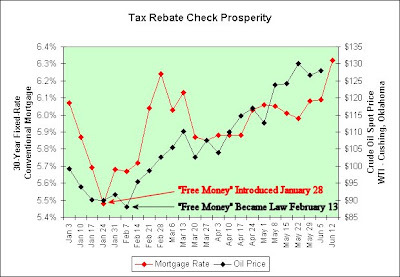 Most discussion centers on how to get us even more liquidity (tax rebate checks and other forms of stimulus). If there is a dam failure or an imminent dam failure and you need to evacuate, know your evacuation route and get out of harm's way. Most of the evacuation routes are congested. Too many people are trying to get out of harm's way simultaneously (see oil and gold prices). Greenspan told us in 1966 that "The financial policy of the welfare state requires that there be no way for the owners of wealth to protect themselves." Was that an observation or a promise? To provide economic stimulus through recovery rebates to individuals, incentives for business investment, and an increase in conforming and FHA loan limits. That's exactly what the consumer needed: higher mortgage rates and higher oil prices. Mission accomplished. "The top references are jokes, blogs and insults. Ninety percent are negative or humorous," said Paul Payack, who runs the Global Language Monitor in San Diego. "It's a tagline that evokes not a smart thing to do, stepping into a trap, exactly what not to do at an apparent moment of triumph. Like 'wardrobe malfunction,' it just has become part of the public consciousness." Sweet! It was really important to me that I was using the term appropriately, lol. The cost of shipping a 40 foot container from Shanghai to the east coast of North America has gone from $3,000 in 2000 to $8,000 because of the cost of fuel, and for many products, the Asian cost advantage has virtually disappeared. I am basking in the stagflationary aura. Okay, maybe basking isn't quite the right word. Cringing seems a better description. Aggravating the problem is the fact that modern new container ships travel faster than old bulk carriers and so use up more fuel, doubling fuel consumption per unit of freight over the past 15 years. Two quick comments. First, just look at how less reliant we are on energy these days. That's what we are told. Second, our impatience is going to be the death of US (United States). We want our subprime housing loan yesterday. We want our products from China yesterday. We'll let our grandchildren worry about how to pay for them. This post inspired by kwark, who pointed out the $8,000 shipping container cost. The Baltic Dry Index, which measures drybulk shipping rates on 40 routes across the world, sank 963 points Thursday to reach 10,142. The index had wavered, but remained above 11,000, since hitting an all-time high on May 20 of 11,793. The index, managed by the Baltic Exchange in London, had previously posted its biggest one-day skid of 443 points on Jan. 17. The global growth decoupling theory once again attempts to fend off the dreaded whack-a-mole hammer. The average Capesize vessel now costs about $180,000 per day, compared with prices of more than $230,000 per day last week. We didn't quite make it to 0.7%. How lucky is that? 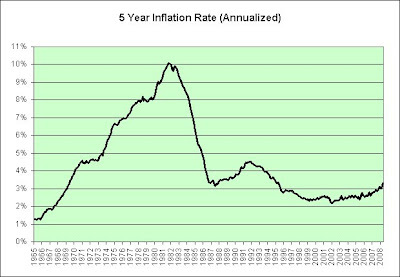 The following chart shows the average inflation rate over the previous five years. It continues to creep up. Here's a closer look at recent years. The red trend line is a 4th order polynomial. It simply represents what my eye seems to see. That doesn't mean my eye is necessarily right though. It is possible the deflationists will be right when we least expect it. I'm not betting on it, but wouldn't rule it out either. What inflation rate is the Fed targeting long-term? It seems their archery skills need improvement. They keep hitting well below the bull's eye. Perhaps that explains the optimism of the bulls. How much longer before inflation expectations become unanchored? Or is this accelerating trend higher something we will all embrace? We do seem to love our tax rebate checks anyway. In theory, the deflationists will no doubt be right someday though, maybe even next week. Who knows? Prechter's Conquer the Crash ("deflationary depression") book is also about five years old. Here's a quote from the book. "You can get rich being short commodity futures in a deflationary crash." Thank goodness I didn't brace for deflation all those years. It would have financially ruined me. Fortunately, I also read Bernanke's 2002 deflation speech. A special thanks to Bernanke for explaining our helicopter economy to me. Although TIPS have been underloved (sold off) in recent months, I can say they earned ~0.64985% in May plus a real yield in addition to that. As I'm planning to hold until maturity I can hardly complain. It sure beats burying cash in the backyard while hoping for the deflation that may or may not come. The 0.64985% number is seasonally adjusted. TIPS are tied to the unadjusted number which is up 0.84209% (a headline number which also benefited from rounding). TIPS therefore actually did a bit better. That being said, the seasonally adjusted number is still more indicative of the true short-term rate though. No matter how you look at it though, TIPS did offer some decent inflation protection in May (unlike three-month treasury bills for instance). The May increase, double what economists had been expecting, provided the strongest evidence yet that the economy is getting a major boost from the $50 billion in economic stimulus payments the government sent out by the end of May, slightly less than half of the $106.7 billion scheduled to be sent out this year. $50 billion in "free" economic stimulus payments allowed retail sales to temporarily jump $4 billion. That's ruthless government efficiency in action. I say temporarily because it is assumed we won't keep getting helicopter drops of money. That might not be the best of assumptions based on the overwhelmingly upbeat and positive praise of this current drop. Who doesn't like "free" money? Of that $4 billion, 25% was for extra gasoline station sales. Rumor has it that the price of gasoline went up. What do we care though? We got "free" money! The stock market was initally up ~$170 billion today (see math in the footnotes) based on the $50 billion in economic stimulus payments generating $4 billion in retail sales but as the day went on it apparently became skeptical of its own overleveraged performance. It ended the day up about $50 billion. This makes complete sense if the entire $50 billion in temporary economic stimulus payments provides $50 billion in permanent prosperity. If so, the government really needs to get with the permanent prosperity program. Think what $50 trillion in temporary economic stimulus payments would do! We'd be literally rolling in money! 1% of $17 trillion is ~$170 billion. At one point the stock market was up ~1% today. Let the finger pointing continue. Since there is no powerful "weak economy" lobby in Washington, please allow me to speak on its behalf. The Fed is claiming that inanimate objects such as food and energy are to blame? The weak economy wishes to know why poor workmen (not to be confused with Chinese workers) always blame their tools. The weak economy also wonders why the blame is being put on supposedly trivial non-core items of the CPI. The weak economy thought it was widely understood those items could be safely ignored. Now the Fed isn't ignoring them, they're dwelling on them? Whose grand monetary defense scheme was this anyway? Does that mean we won't be seeing any more Hail Mary helicopter drops? WASHINGTON (AP) -- The economy remained "generally weak" heading into summer as rising costs for energy and food pounded consumers and forced some companies to push their own prices higher. The economy would like to point out that it has been generally weak for eight years. If not for the swift Fed action of biblically low interest rates it may have keeled completely over. The weak economy sarcastically asks why interest rates aren't just kept at zero percent long-term since things worked out fantastic using the power of hindsight (according to the Fed anyway, since it isn't blaming itself). Those rising prices carry the risk of both spreading inflation and putting another drag on overall economic growth. The weak economy has just sprayed beverage through its nose (beverage I might add that was hoarded at Costco, not purchased at a sit down restaurant). The weak economy had been working under the apparent mistaken assumption that rising prices and inflation were more than simply correlated. The weak economy wishes to apologize for the use of its questionable nose spraying debate tactics though. It was not intentional. Bernanke, in a speech earlier this week, downplayed the big jump in the jobless rate, saying the danger that the economy has fallen into a "substantial downturn" appears to have waned over the past month or so. The weak economy wishes to know what data Bernanke is looking at. The employment reports? The price of oil? The latest round of multi-billion dollar bank confessions? The rising foreclosure rates? Extremely high housing inventory? Falling home prices? The recent "strength" in the stock market? Presidential popularity polls? Maybe it is mood rings. Nope. That can't be it either. Consumer sentiment stinks. About the only thing left to consult is the sarcastic ball. Yeah, that must be it. The Fed "will strongly resist an erosion of longer-term inflation expectations, as an unanchoring of those expectations would be destabilizing for growth as well as for inflation," the Fed chief said Monday evening. The weak economy attempted to take another sip of its beverage. Bad timing!! It is hard to get more information out of the weak economy right now. It is belly laughing as it digests the implications of higher interest rates to the housing market and the very banking system Bernanke is so quick to protect. The weak economy cackles, "The Fed will resist much like a simple cork resists the power of the frozen liquidity cannon!" One lesson learned during World War II is that hoarding of one item can cause a run on another. In 1943 the rationing of shoes touched off hoarding of clothes, and the rationing of canned meats and fish started panic buying of canned vegetables and fruit. Another lesson is that scarcity is not essential to hoarding. In 1973, reporting a Congressman's fatuous remark that supplies might grow short, TV Host Johnny Carson touched off nationwide panic buying of toilet paper. I have taken the price index for household paper products (not seasonally adjusted) and adjusted it by the CPI (seasonally adjusted). The red line is a very tame exponential growth curve (~0.2% per year, showing that household paper products are inflating ever so slightly faster than the overall average). Not much to worry about there. It is also fairly in line with what I've been seeing in toilet paper pricing over the last ten years. I was hoping to see the 1970s in this chart but the data didn't go that far back. I think it would have been fascinating to see the panic induced by Johnny Carson's joke (which I stumbled upon looking for additional information on toilet paper pricing today). I'm confident a similar joke these days would do the same. Okay, so what does this mean? In my opinion, it appears we are heading back to the "Danger!" part of the toilet paper business cycle. Any short-term benefit of inflation is now being swamped by the long-term harm of inflation. 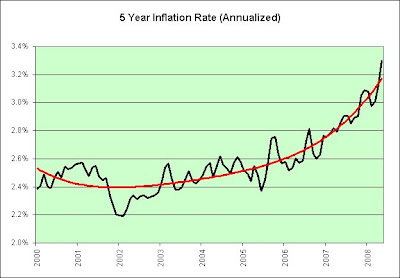 The following link is a pretty good article about inflation's benefits and harms. It was written in the late 1990s, well before our current problems emerged. It is therefore a bit easier to trust the commentary and appreciate the similarities. If not for our massive trade deficit, I'd probably be a deflationist in the short-term based on the chart above and the contents of this article. I don't like investing/gambling for the short-term though. As it stands, I'm a reluctant long-term paper stagflationist as I embrace more of the same (the last 10 years of relative stagnation combined with inflation and deflation scares for as far as the eye can see). 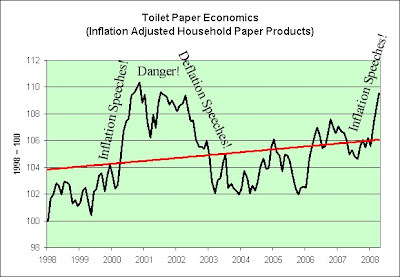 In conclusion, I expect (and could be wrong) that toilet paper will keep up with inflation long-term and possibly even do a bit better. Further, unlike I-Bonds paying a mere 0% over inflation the government can't tax the inflationary gain. Friday's market rout in employment, oil, the dollar and stocks was not the end of the world, but it is a warning. The message is that the current Washington policy mix of easy money and Keynesian fiscal "stimulus" is taking us down the road to stagflation. There seems to be a bull market in stagflation stories these days. A small part of me thinks that this might indicate a top in stagflationary thinking and I should consider changing my name. The other larger part looks to horrible real interest rates. How can THAT make people stop hoarding hard goods? It certainly isn't altering my hoarding behavior anyway. So what is the risk real interest rates will rise? How can they rise much when the housing market is falling apart and there is SO much money looking for safety (or possibly should be looking for safety at the very least)? Toilet paper continues to appear on my Costco shopping list. I buy it every time I visit the store. So far it has been a decent plan. In addition to the cost of the paper itself rising 5% this year so far, the cost to transport it home continues to escalate. The fewer trips I have to do in the future the better. The employees must think I have serious digestive problems. That's somewhat true. I can't stomach where this economy is headed. "Under this order, people with concealed weapons will be asked to leave or to hand over their guns," he said. Nickels believes case law gives him authority to establish the prohibition. Why am I suddenly reminded of the Great Depression? Nickels' order comes in the wake of a Memorial weekend shooting at the Seattle Center that left three people injured at the Northwest Folklife Festival. We'll be SO much safer now. We all know that all it takes to stop a crazy person from going on a killing spree is an executive order from the Mayor. Fortunately, he included knives in this ban. While crazy people will still have access to knives, the ban will encourage them to stay home lest they break the law. Unfortunately, since it is just an executive order it only applies to crazy government workers. I have no idea what percentage of the problem this might represent. It would apply to the mayor himself though. That's at least a decent start I suppose. A man armed with a knife has killed seven people and injured 10 others in central Tokyo. Had there been a knife ban he would have been absolutely powerless. It is also possible that the weapon was developed in response to the moratorium on edged weaponry under the Satsuma daimyo after invading Okinawa in the 17th century, and that the weapon was most likely conceived and used exclusively for that end, as the configuration of actual flails and bits are unwieldy for use as a weapon. Also, peasant farmers were forbidden conventional weaponry such as arrows or blades so they improvised using only what they had available, farm tools such as the sickle. The modern weapon would be an effective flail. Okay, okay. We could clearly ban all blunt instruments too. That surely would solve the problem. OMG! Ban cars at malls! I completely forgot how dangerously blunt they are!! If we stay on the path we are on, it is only a matter of time before my attitude and thoughts are banned. I see it as a post Great Depression level risk. The risk would only become a reality if our government embraced the concepts of torture (waterboarding) as our economy begins to unravel (It's Only Going to Get Worse). What are the odds of that though? This poster is from the 1938. The caption: "Germany is free!" "Stagflation is really a nasty word," said Victor Pugliese, with Broadpoint Securities in San Francisco. "The last time we had it, we had a terrible market." US stocks tracked sideways through the 1970s as the nation grappled with oil shocks in 1973 and 1979. For months, economic Pollyannas have looked beyond the dismal headlines and promised a quick recovery in the second half. They're dead wrong. This headline so reminds me of one Murphy's Laws. Things always take twice as long as you anticipate, even if you take into account Hofstatler's Law. Using a variant of Hofstatler's Law, the economy must be twice as bad as I think. Here's the rub. Now that I have concluded that the economy is twice as bad, the economy must therefore be four times as bad, and so on. No wonder things can easily spiral out of control. That's just a theory though. The only thing we know for sure is that the economy is worse than I think. It says so right in the headline. I'm really sorry to tell you this. We clearly would have all been better off if I thought the economy was doing a lot better and/or I simply stopped thinking. By the way, if you happen to think the economy is even in worse shape than I do (seems unlikely but it is always possible) then it would be even worse than YOU think. If so, please do us all a favor. Stop thinking. No good can come of it. Trust me on this. I'm already feeling VERY guilty. My misery (index) doesn't love companies. TIME TO BRING BACK THE MISERY INDEX? The MI was always a rather crude combination of a proportion (the unemployment rate) and a rate of change (the inflation rate). But the sum of these two unhappy indicators can serve as a rough measure of economic pain. Take the recent 3.9% reading on year-over-year consumer price index inflation, add May's 5.5% jobless rate, and you get a misery index of 9.4%. While far below the peak -- which topped 21% in mid-1980 -- the MI can be regarded as a harbinger of the economic outlook over the next year or two. That outlook is for stagflation: inflation combined with slow or stagnant growth and rising unemployment. Once again using Hofstatler's Law, it seems I'll be keeping my stagflationary name twice as long as I originally thought, and so on. That isn't a good harbinger if true. I bought 20-Year TIPS and 30-Year I-Bonds in January. Heaven help the deflationists. Costco said same-store sales rose 9 percent, ahead of the 6.9 percent analysts were expecting. I really hoped to give Costco shareholders a solid 10 percent. I'm just one guy though. There's only so much I can hoard. Sorry! Wal-Mart was one of the few retailers to specifically mention a benefit from stimulus checks. The world's largest retailer said same-store sales rose 3.9 percent, or 4.4 including fuel sales while analysts surveyed by Thomson Financial predicted a 1.6 percent rise. Wal-Mart is second on my list, after Costco. I bought a LOT of small rectangular pyrex pans there (and gold toe socks!). I find them perfect as a TV dinner replacement for the freezer (the pans, not the socks ;)). A friend of my girlfriend recently said she bought a lot of pyrex pans for freezing as well (no idea that we'd done it too). I wonder how many others have done it or are planning to do it? I can safely say from personal experience it doesn't happen unless you are planning to permanently change your long-term behavior. Rival Target Corp., which has a somewhat more upscale clientele, said same-store sales fell 0.7 percent, while analysts expected an 0.2 percent drop. I dropped by Target a few days ago and walked out empty handed. I balked at the prices. Apparently I'm not alone. J.C. Penney Inc. said same-store sales fell 4.4 percent, better than the 5.8 percent analysts expected. J.C. Penney is still in business? Who knew? This is all great news though. Alfred E. Goldman, chief market strategist at Wachovia Securities, contends the market is entering a stronger period because of investors' ability to not overreact to some bad news such as rising oil prices and a weak dollar and to focus instead on the retail sales and jobless claims numbers. We wouldn't want to overreact to $120+ oil. That's for sure. Funny that housing and credit didn't make his list. I guess those are the crazy aunts in the attic for a banker. Probably best not to mention them. Further, why focus on the weaker dollar when we can instead focus on the freshly printed "stronger" dollars (tax rebate checks) to help temporarily drive retail sales and temporarily protect the jobless claims numbers? "What investors are doing is looking beyond the valley to the peaks ahead," he said. "The big picture is that we're in a market that's transitioning from a bear to a bull." Wachovia? Why weren't they able to see this "bear" coming and profit off their own demise? As a side note, we have just the one valley but we'll be getting multiple peaks? Is that the big picture? There has never been a better time to be in a valley? David Lereah eat your heart out. Meanwhile, the Fed struggles with wave theory (the idea that there isn't one valley for every peak) too it seems. In order to keep these theories from violating the principle of the conservation of energy, the mathematics requires that any collapse be incomplete...All of these options seem counterintuitive. Surely there must be some intuitive solution when you've got the ability to print free money. Maybe they just need to print it faster than the price of energy increases? Would that work? Complete Collapse: Making Sure "It" Doesn't Happen Here? It all makes sense now, at least in my twisted world. Too bad I had to change the title slightly though. No, it isn't the first part that's concerning. It is the addition of the question mark. “ I don’t think it’s too much of a mystery as to why energy costs are going up,” said Bowyer. He said China’s current oil imports at 3.7 million barrels a year, and by 2030, the figure is expected to be 10.9 million barrels. How the heck is China able to afford such rapid increases though? It isn't like we're sending them our money. Okay, okay, it is like we're sending them our money with our massive trade deficit. You've got me there. I Katrina find Katrina that Katrina hard Katrina to Katrina believe. Katrina where's Katrina the Katrina proof Katrina to Katrina back Katrina such Katrina a Katrina questionable Katrina claim? “ Instead of petroleum coming to a refinery, it will be trees,” said Bowyer, who envisions standard paper mills being reconfigured for producing not just reams of paper, but barrels of biofuel, derived from trees. I bought wooden dowels from Home Depot's lumber department today. There's a sticker on them: Made in China. No joke. What is it we do as a country these days? Please don't say Structured Investment Vehicles. They are only cheap on paper. Note to self: Keep hoarding nonmonetary paper products. Toilet paper has very little backside risk. Oops. I meant downside risk. That's enough to make me flush. Um, I mean blush! The rapid march to biofuels has its skeptics. “ I’m old enough to remember the oil crisis of the early ‘70s and how that generated a lot of talk around different forms of energy,” said retired MSU forestry professor Bob Daniels. There's that '70s word again. Go figure. The oil crisis of the early '70s was political and monetary. We better hope this oil crisis isn't political, monetary, and geological. That last one's a bear. Hey, it isn't like we've got troops fighting overseas in a forever war (i.e., Vietnam) and we've got negative real interest rates (1970s style) at home. Okay, you've got me again. We do. But geological? That's too silly to contemplate. That would imply peak oil is here. Just because United States oil production peaked long ago doesn't mean it must peak globally though. That would be an amazing coincidence, don't you think? Heck, even that's not a problem. We can simply print more "paper" money to compensate (assuming we can use the paper as a heat source as stated in this article). No harm, no foul. 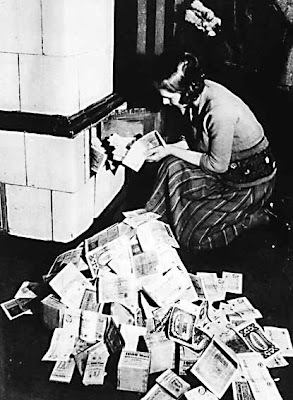 Inflation 1923–24: a woman feeds her tiled stove with money. At the time, burning money was less expensive than buying firewood. I live in a darkly sarcastic dream world. I should point that out. I should also point out that I'm not bracing for hyperinflation. I'm in the deflationary Great Depression combined with the inflationary 1970s camp. Two wrongs seem unlikely to make a right. The Escondido-based company says it will throw in a free four-bedroom home worth $400,000 (£200,000) for buyers of one of its luxury detached houses, which cost from $1.6 million (£800,00). Bummer. It is not an item of equal value. It is an item of lesser value. That's not all that much of a sale in the grand [ponzi] scheme of things. She said the idea, initially a joke, came out of a weekly brain-storming meeting as the company sought for way to stimulate the slow market by "creating a buzz". Most of our country's "brain-storming" economic policies intended to "stimulate" our "slow market" were "initially a joke", if you like gallows humor that is. In January, Winnebago said it was laying off 300 workers to deal with the downturn, which drove at least one RV manufacturer -- Perris, California-based National RV -- into bankruptcy late last year. Those who remain in business are scrambling to adjust by laying off workers, idling plants and -- in the case of Winnebago -- bringing back cheaper, more fuel-efficient van-like vehicles whose popularity peaked during the 1970s oil crisis. Surely there must be some escape from rising oil prices. Tia and Tony sneak into the Winnebago camper owned by embittered widower Jason O'Day, who is traveling alone to see the country. Oil’s Not Well in the U.S. But there's a critical difference between housing and oil that makes the impact of higher oil prices much worse. The housing bust is due to a slowdown in the demand for housing, not in the supply of a critical commodity, such as oil. This means that many of the resources that had previously gone into the housing industry, such as labor and materials, can now be released to other sectors of the economy. In contrast, rising oil prices are an outright cost that does not release other resources into the economy. The lumber can now be used to make toilet paper (or not). Construction workers can bring their highly specialized job skills to government projects and/or unemployment lines. Real estate agents can bring their people skills to the world of debt collecting. Yeah, things are lookin' real good. If oil prices continue to rise, I recommend that the government release some oil from its strategic reserve and perhaps raise the margin requirements on oil future markets to reduce speculation. I certainly do not blame speculators for the surge of oil prices, as I believe there are many fundamental forces at work raising energy prices. Nevertheless, such moves could break the inflationary psychology and warn speculators that the price of oil can go down as well as up. Why stop there? If "some" release is somewhat good, then an entire release must be entirely good. Release it all. That'll show them. There's no sign whatsover of the wage-price spiral? First, and most importantly, the stagflation of the 1970s was not isolated to America. It was a global problem. If companies are told to pay higher wages, they may have to raise their prices to stay out of the red, the economists argued, warning this could be the beginning vicious cycle. I bring Chinese wages up because unlike the 1970s, "Made in China" seems a very popular sticker these days. We send China our paper dollars and they send us back actual goods. Their workers now want raises? No problem. We can print more money to appease them in the exact same way we printed more money to appease ourselves (tax rebate checks). We’re buying a lot more from third-world countries today than we did a dozen years ago, and the largest increases have come in imports from Mexico, where wages are only about 11 percent of the U.S. level, and China, where wages are only 3 percent of the U.S. level. Trade still isn’t the main source of rising economic inequality, but it’s a bigger factor than it was. We can also print more money to appease Mexico if need be. This would be in addition to the Mexican government's monetary printing press of course. Governments around the world are under pressure to intervene to help the poorest cope with the sharp food price rises. About the trade deficit: These days the United States imports far more than it exports. Last year the trade deficit exceeded $600 billion. The flip side of the trade deficit is a reorientation of our economy away from industries that export or compete with imports, especially manufacturing, to industries that are insulated from foreign competition, such as housing. Since 2000, we've lost about three million jobs in manufacturing, while membership in the National Association of Realtors has risen 50 percent. Those three million lost jobs in manufacturing led to cheaper goods. I think that deflationary ship has just about run its course. Now we're looking at an iceberg (as seen here). The trade deficit isn't sustainable. We can run huge deficits for the time being, because foreigners - in particular, foreign governments - are willing to lend us huge sums. But one of these days the easy credit will come to an end, and the United States will have to start paying its way in the world economy. What are they going to do? Stop selling us goods? It seems far more likely they'll just raise prices. Of course, if they raise prices and we continue to buy anyway (think oil), then the trade deficit doesn't really get all that much better. Does it? To do that, we'll have to reorient our economy back toward producing things we can export or use to replace imports. And that will mean pulling a lot of workers back into manufacturing. So the rapid downsizing of manufacturing since 2000 - of which G.M. 's job cuts are a symptom - amounts to dismantling a sector we'll just have to rebuild a few years from now. The "free (lunch)" deflation we imported over the last few decades would be undone? I can't argue but it does sound expensive. I think I'll remain a stagflationist if you don't mind. "Government has slowly been pinching away the nation's savings through very low interest rates, well below inflation," Robertson said. The main cause of falling real wages in Zimbabwe is reduced economic activity. Other than the magnitude of the potential problem, how is Zimbabwe's inflationary path all that much different than ours? I doubt very much Zimbabwe's wage-spiral can be blamed when their unemployment is 80%. More than $50 million of inventory is being sold at 86 Sharper Image store-closing sales throughout the United States, liquidators the Hilco Organization and Gordon Brothers said in a statement. Part of me (certainly not all) thinks this could easily mark a (zz) top of the commodity boom. The following song was released in 1983. That wasn't exactly the best time to still be hoarding gold watches and/or diamond rings. That being said, I remain a long-term paper stagflationist just the same. 1983 was also not a great year to bury paper dollars in the back yard. As seen here, the consumer price index has more than doubled since then. The pure stagflationists might point out that gold has too and that gold watch hoarders in 1983 just needed to be very patient. Who would I be to argue? News service Reuters said the price paid for the Patek Philippe chronograph watch is a record high for the auction house that handled the sale, Sotheby's. HONG KONG: A press scrum waited for the mystery man in the gray shirt to exit the room. They chased him down the hallway, surrounded him, and peppered him with flashbulbs and questions, until hotel staff intervened and he managed to slip into the men's toilets. Singgih Gunawan of Singapore finally emerged to address the media briefly in Mandarin. His claim to fame was spending 1.89 million Hong Kong dollars, or $242,000, on 12 bottles of 1990 Domaine de la Romanée-Conti at what proved to be the biggest lot at the biggest wine auction in Asian history. Perhaps I have taken some liberties with the headlines here. The mystery man might not have hoarded the wine as an inflation hedge. The 1990 wine might be exceptionally good and perhaps none of its $242,000 price tag is even remotely inflationary. It could also be that he was merely thirsty and found no suitable alternatives. Further, he might have actually needed to use the bathroom and welcomed the questions of the press. I've clearly made a lot of questionable assumptions here. It’s troubling when mundane, normal, private objects and activities are permanently recast as scary threats. For how long can we not bring a purse? For how long will they make us take off our shoes at the airport? When does the embargo on shampoo end? 2030? 2040? When does this stop? Level Orange is our new normal—that’s the threat. Not fanny packs. Not diaper bags. We give up a little freedom here, and a little freedom there, all the while being told it’s for our own good. And then it’s gone, and handbags will be the least of our problems. Orman estimated her liquid net worth at about $25 million, with another $7 million worth of houses. With just $1 million of that in stocks, it means that just 4% of her liquid net worth is in the stock market. What does Orman do with the rest of her money? Solomon asked, and was told: "Save it and build it in municipal bonds. I buy zero-coupon municipal bonds, and all the bonds I buy are triple-A-rated and insured so that even if the city goes under, I get my money. I take a little lower interest rate to make sure my bonds are 100 percent safe and sound." As for playing the stock market, Orman said "I have a million dollars in the stock market, because if I lose a million dollars, I don't personally care." She wanted 100% safe and sound from a risk standpoint, but also wanted superior rewards. Nice trick, huh? Wasn't she clever. How's that working out so far? The investments are looking pretty good as long as you don't factor in muni bond defaults surging, the questionable credit quality of the muni bond insurers, and the questionable assumption that inflation will remain tame long-term. But wait a minute: Municipal bonds never default, do they? Or at least this is how they are perceived by individual investors, right? We're probably going to see a lot more munis default this year and in the years to come, because of the subprime crisis and maybe, just maybe, because of the high price of a barrel of oil. Credit-rating firms shouldn't be giving top grades to bond insurers that borrow money at 14 percent or whose stock has dropped 95 percent, Buffett said at a press conference today in Omaha, Nebraska, a day after Berkshire's annual meeting. The chief executive of HSBC bank, Michael Geoghegan, last week called on the Bank of England to raise interest rates, saying: "Inflation is a long-term problem because there is no long-term will to solve it."